The brochure w e have been working on for our client, Third Sector First, which will be used to promote the Connect2013 conference in Dumfries next week, is now available. The brochure contains the Connect2013 programme as well as full details of all the workshops for the event and will be printed and handed out to delegates on the day. Highlights of the conference will include a keynote address from John Swinney MSP and guest speaker Calum Irving, Chief Executive of Voluntary Action Scotland. Information about the exhibitors taking part in the Funding Providers’ Village is also included in the brochure. Connect2013 takes place on Friday 8 November at the Cairndale Hotel in Dumfries and over 200 people are expected to attend. 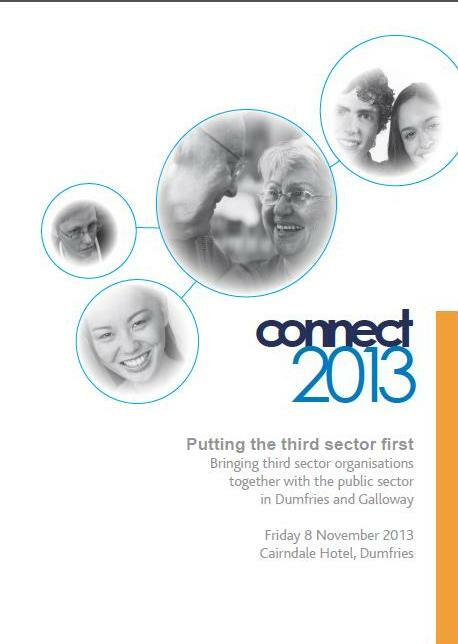 It is being organised by our client Third Sector First, Dumfries and Galloway’s third sector interface. A copy of the Connect2013 brochure can be downloaded from our publications page. This entry was posted in Events, Publications, Third Sector First and tagged Connect2013, John Swinney, social enterprise, third sector, Third Sector First on October 31, 2013 by Ethos public relations news.